Changing the standard Tacoma front bumper into a full function accessory mounting system and outfitting your vehicle for off-road and expedition work for the specific terrain and task at hand. 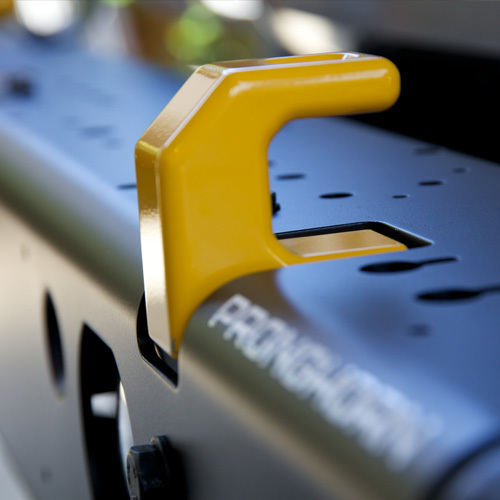 Pronghorn MFES-Tacoma Aluminum Bumper Features. Traditional off-road gear is strong, but it is also seriously heavy. 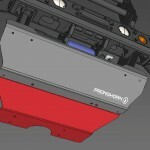 This extra weight overloads the vehicle suspension and adversely effects vehicle performance, handling, and endurance. Our US-made Tacoma aluminum bumper (MFES-Tacoma), a Modular Front-End System (MFES) is built with a fully boxed design for strength and laser cut, Tig welded aluminum for light weight. All the strength of a comparable steel bumper system, at half the weight, for maximum performance. Not every off-road vehicle is going to need the same front-end system. You may require full grill and headlight protection. Or perhaps you need maximum approach angles and clearance for technical trails. We designed the MFES-Tacoma aluminum bumper to be fully modular with 5 configurations that allow you to design the front-end system that best fits your specific requirements. This is off-road and that means you will need recovery gear. For the MFES-Tacoma aluminum bumper we provide multiple recovery gear options, as well as multiple mounting points to meet your specific recovery requirements. 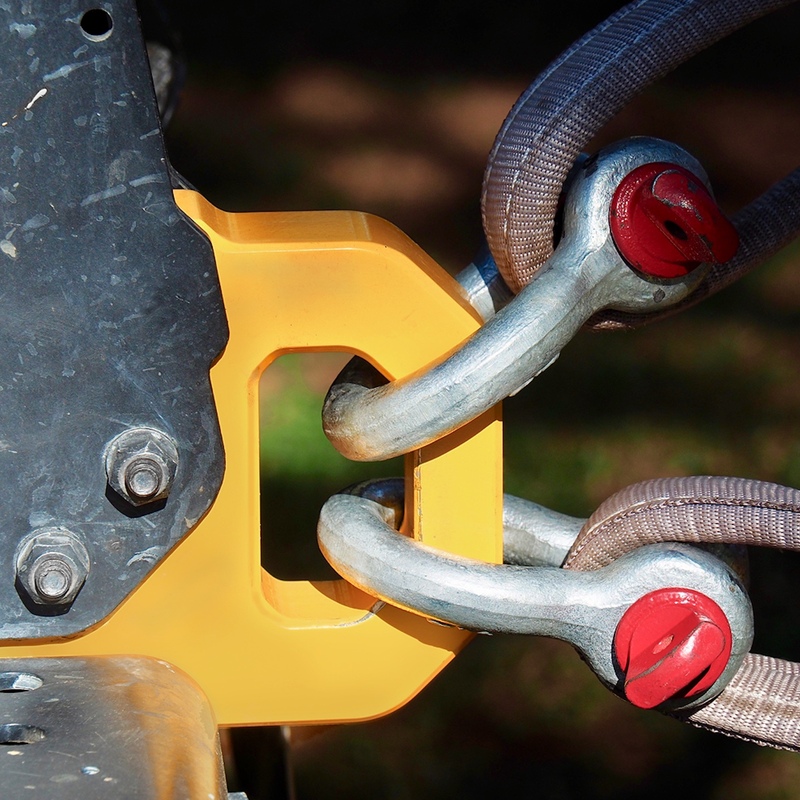 From dual recovery hooks, to the high-strength shackle mounts (left and right side mounting options), to our patented maximum strength Rotator Shackle Mount, we offer the largest number of recovery options of any front-end system to meet your needs. Need a winch? 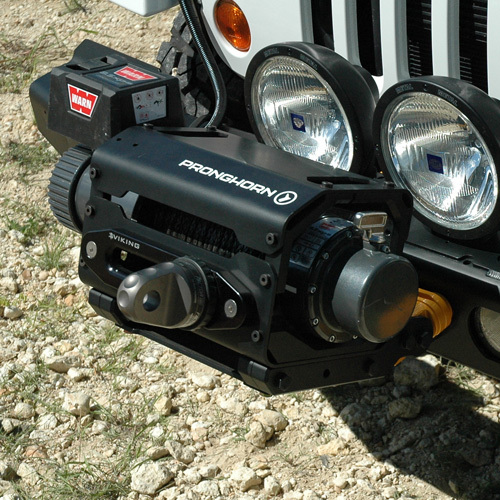 We offer a traditional top mount winch option in addition to our innovative GearMount winch system. 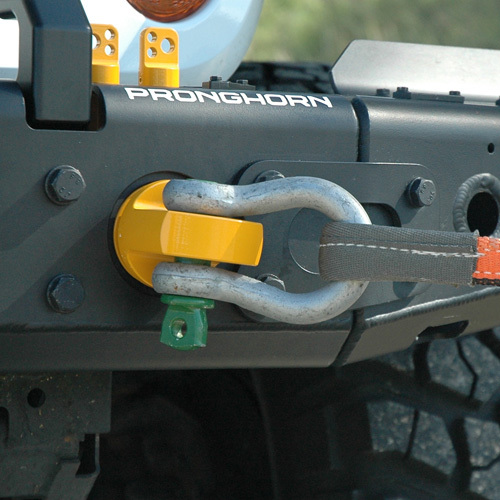 allowing you to quickly and easily attach the winch when and where you need it. Well designed off-road and expedition gear should include some serious functionality. 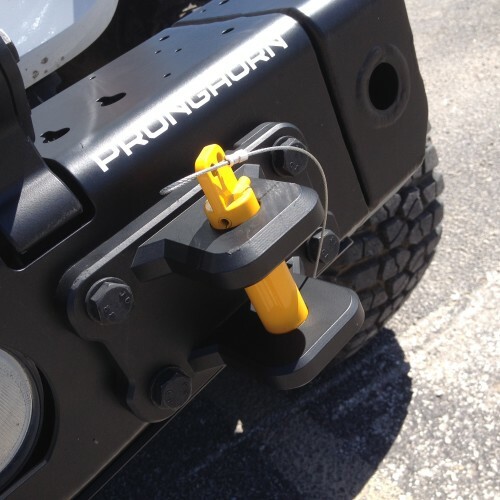 So, in addition to providing numerous pre-drilled mounting points for your accessories, we added our patented GearMount accessory mounting system. 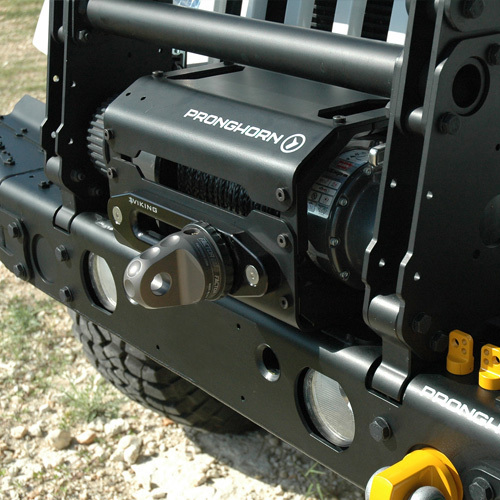 GearMount allows you to quickly and securely attach winches, cargo racks, work/cook tables or any of the other GearMount accessories to the MFES-Tacoma aluminum bumper, our rear bumper system and our side rail system. 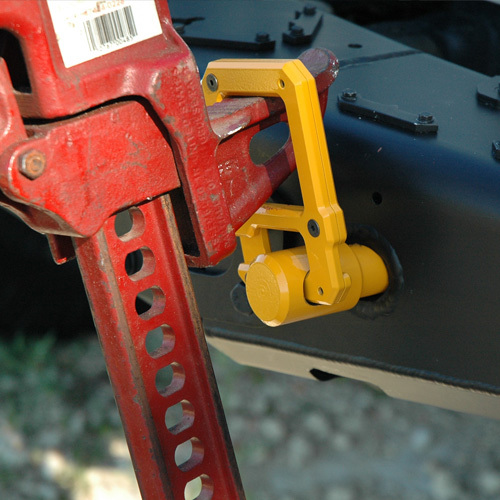 And unlike loose fitting receiver hitch mount designs the GearMount system uses two dedicated mounting points that provide secure, zero-freeplay gear attachment. Can install it with basic hand tools. No die grinders, cut-off wheels, or paint required. A well designed off-road front-end system needs to be strong enough to absorb and deflect impacts. 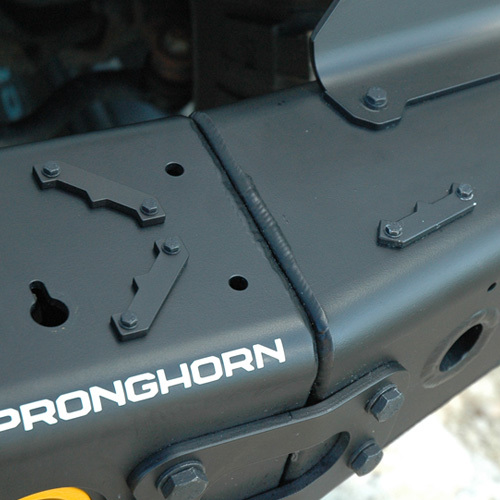 The Pronghorn Tacoma aluminum bumper (MFES-Tacoma) is engineered with a fully boxed design to shrug off off-road impacts. This design is considerably stronger than the open or U-section design used by nearly every other manufacturer. Our fully boxed design is more expensive to produce, but it gives us a stronger and lighter part. This fully boxed structure is also design to provide controlled deformation in a vehicle-to-vehicle collision. This “as strong as it needs to be” approach allows the MFES-Tacoma aluminum bumper to shrug off impacts found in off-road environments, while still providing the right amount of deformation during collisions to protect the vehicle frame and crumple zones, as well as the vehicle occupants. A bumper is of little value if your bumper survives the collision, but your frame is damaged and your Tacoma is totaled. When designing the Pronghorn MFES-Tacoma aluminum bumper, as well as our upcoming Modular Rear Bumper System (MRBS), we knew we needed to reduce weight while still providing strength. High-strength aluminum was the logical choice. Ask an engineer, or anyone in motorsports or aerospace, and they will tell you the benefits of aluminum: Lightweight, excellent strength-to-weight ratio, and minimal maintenance (rust proof). We engineered every aspect of the MFES-Tacoma aluminum bumper to contend with the abuses of the off-road environment while still delivering lightweight performance. 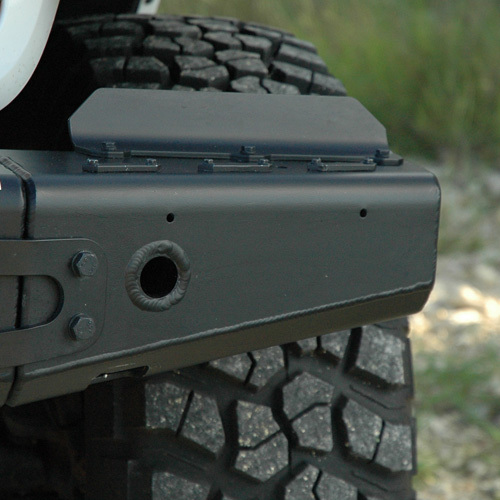 The main and outer body sections of the MFES-Tacoma aluminum bumper are constructed from 3/16” 6061-T6, marine-grade aluminum to provide optimal strength and impact resistance. Recovery gear and mounting points are CNC machined from 6061-T6 and 7075-T6 aerospace-grade aluminum for extra strength. To ensure high-strength performance we use all grade 8.8 fasteners on the MFES-Tacoma aluminum bumper treated with a 3-stage OE-grade coating for maximum corrosion protection (1,000+ hr salt spray test certification). Whether the aluminum structure, the coatings or the fasteners. Every aspect of the MFES-Tacoma aluminum bumper has been designed to deliver lightweight and high-strength performance in every off-road and expedition scenario.